Well this one called the volcano eruption. 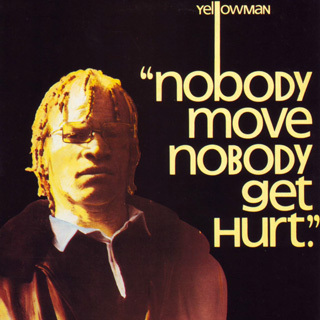 Yellowman a fe come new brand. and some of them wear it 'till it resemble dirt. He said he want me to join the army. I ain't gonna do it officer. No way. I ain't gonna do it. Turn out your left pocket. A searching for a chrome automatic. A searching if you have any ratchet. He said what is your number? I didn't answer. What is your number? I still don't answer. What is the number boy? I really don't answer. Then me started to answer. Him come from the planet of earth. He come from the planet of earth. Say granny in a kitchen a cook rice and chicken. The dread out a door a cook ital stew. No trouble granny, granny never trouble you. Natty cook up him ital stew. Ca' natty come from the planet of earth. Ca' things me used to do me na go do it no more. Things me used to do me na go do it no more. but hear Yellowman come fe tell you the score.